For decades, lawyer Yoon Hee-woong has built his career providing legal advice for corporations. 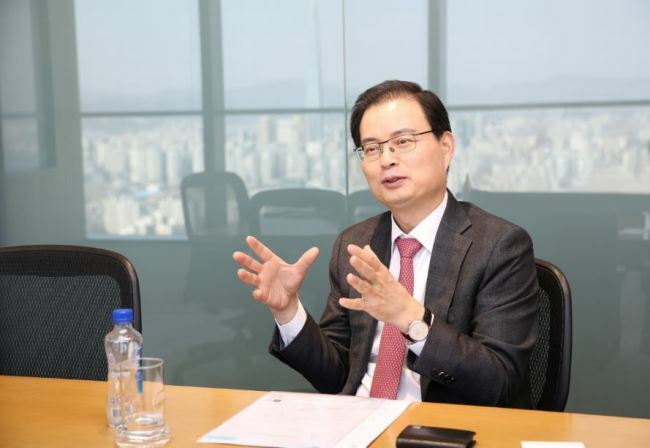 Since joining the South Korean law firm Yulchon in 2000, he has been paving the way for large business groups to take over financial companies, especially in the wake of the global financial crisis in 2007-2008. A big deal he helped close in 2007 was retail giant Lotte’s purchase of Daehan Fire & Marine Insurance. A year later, Yoon was involved in Hyundai Motor’s takeover of Shinheung Securities and Hyundai Heavy Industries Group’s acquisition of CJ Investment & Securities. Now, the 54-year-old M&A specialist serves as one of the three managing partners at Yulchon. During his three-year term, he plans to leverage the law firm’s versatility in markets at both home and abroad. In particular, Yoon is pinning hopes on a boom in Indonesia. “We are witnessing a new wave of Korean investments in Indonesia’s financial sector,” Yoon said in a recent interview with The Korea Herald at Yulchon’s headquarters in Seoul. The main attractive points include fast-paced economic growth, an openness to foreign investment and a stabilizing political system. “Political uncertainties are coming down in Indonesia,” the lawyer said, citing that for years this instability had dampened investor appetite. As the fifth-largest Korean law firm by number of M&A deals, Yulchon has a vast team of 110 employees on the team. Overseas, it has been trailblazing legal services in countries like Vietnam and Indonesia. It has been operating since 2007 in Hanoi, in Ho Chi Minh City since 2010 and in Jakarta since 2017. The firm also has offices in Moscow, Shanghai and Yangon. Yoon stressed the importance of a law firm’s capability to localize and understand the culture and majority religion, which is different for each country. For example, Indonesia’s Sharia principle prohibits lenders from taking interest. Among five major law firms in Korea -- Kim & Chang, Lee & Ko, Shin & Kim, Bae, Kim & Lee and Yulchon -- Yulchon was the first to enter Indonesia. The sophistication of the law firm that is also localized allow Korean companies to understand the local culture better, he said. Yulchon worked together with a local law firm in each deal because Indonesia does not allow a foreign law firm to independently operate in Indonesia. The Korean law firm helped KB Kookmin Bank buy a 22 percent stake in Indonesia’s Bank Bukopin for roughly 1.5 trillion rupiah ($105.72 million), after it exited from Indonesia more than 10 years ago. It also represented state-led Industrial Bank of Korea when it bought shares of Bank Agris and Bank Mitraniga. Another client for M&A was Line Financial Asia -- a subsidiary of Japanese firm Line -- which entered into an agreement to acquire a 20 percent stake in KEB Hana Indonesia. Yoon predicted that more investors from home will go overseas for new opportunities. “Korean institutional investors with money on hand will go abroad,” he said. In Korea, Yulchon is out to enhance M&A capacities related to information and communications technology. It represents tech startups like Viva Republica, the operator of money transfer app Toss, and e-commerce platform operator Coupang. Last year, Yulchon advised L’Oreal in snapping up Nanda, the operator of an e-commerce platform dedicated to beauty items. As the only member of TechLaw Group, a coalition of law firms, Yulchon in February created a “New Industry IP Team,” devoted to consulting for protection of intellectual properties. It has represented Korean firms like Seoul Semiconductor and Dayou Winia. Yoon said it is time for M&A lawyers to be equipped with a thorough understanding of both legal and technological aspects. “Traditionally, ICT issues have been left untapped by lawyers, but as technology advances, there is a growing demand for law firms to do compliance work so that they can protect a client company’s technology from infringement, he said.